CHARLOTTE — The Charlotte Touchdown Club presented its annual luncheon on Friday June 19, where former Washington quarterback, Joe Theismann, was the guest speaker. 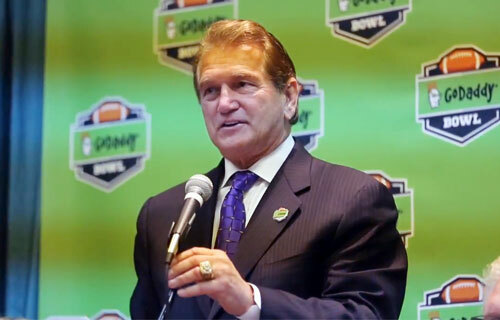 For over an hour, Theismann spoke about his football career and his relationship with former coach Joe Gibbs, who introduced him to the crowd. Before his speech, Theismann talked with the Observer about the state of the Carolina Panthers, QB Cam Newton’s recent contract extension and the injury that ended Theismann’s career. For Q&A with the Observer, click here. Source: The Herald. The Charlotte Touchdown Club is a 501(c)3 non-profit organization founded in 1991 for the purpose of promoting high school, collegiate, and professional football in the Charlotte, North Carolina region. Since its inception, the club has grown as well as diversified boasting a sponsor team of more than (70) companies. 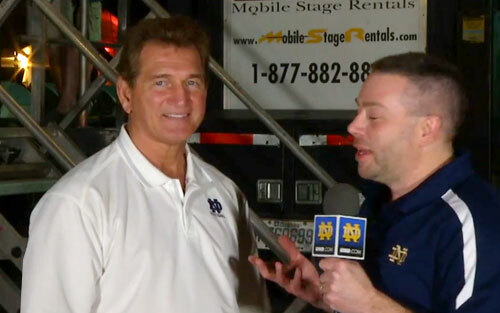 Photo shows Joe Theismann speaking about the BCS championship in a Jan. 2013 interview. Each year the Charlotte Touchdown Club sponsors and members look forward to the return of the Speakers Series Luncheon Program. This popular series, hosted at The Westin Hotel, features speeches by Panther representatives, college coaches, as well as present and former professional greats. These five luncheons averaging more than 550 attendees provide the perfect atmosphere for entertaining business associates, potential customers, out-of-town guests and others. The luncheons also offer outstanding networking opportunities! In addition, the Touchdown Club is co-presenting organization of the Carolina Panthers annual Countdown to Kickoff Luncheon featuring the entire team. Joe Theismann achieved his most enduring NFL fame in his 12 seasons playing for the Washington Redskins, where he was a two-time Pro Bowler and quarterback of the winning team in Super Bowl XVII. He was inducted into the College Football Hall of Fame in 2003. Theismann’s career ended after a Monday Night Football game against the New York Giants in 1985, when he broke his leg while being sacked by Giants linebackers Lawrence Taylor and Harry Carson. Following his retirement from football, Theismann began a career as a sportscaster. He worked as an analyst with ESPN, primarily with Mike Patrick, for the network’s Sunday Night Football package and for one season of Monday Night Football with Mike Tirico and Tony Kornheiser. Theismann is also a popular motivational speaker. If you would like to book NFL speakers or professional athletes like Joe Theismann for a speaking engagement, personal appearance, autograph signing, product endorsement, fundraiser or special event, contact Joe Theismann’s booking agent for appearance and speaker fees at Sports Speakers 360. For booking agent and appearance fees and costs on how to book Washington Redskins players for appearances, call 1.855.303.5450.